Mexican heather, also known as false heather or Cuphea hyssopifolia, is a native shrub of Mexico, where it thrives in the sun. Mexican heather is appreciated for its compact size, small leaves and a profusion of tiny, summer-blooming purple flowers. Some varieties of Mexican heather produce white or pink blooms. Mexican heather is hardy in USDA zones 9 to 11 and can be grown as an annual in areas that experience freezing temperatures. Mexican heather is a dwarf shrub, also referred to as shrublet or sub-shrub, which can be grown in a hanging basket. Purchase a large hanging basket. The basket can be any container to which chains can be attached to support the weight of the container, soil and Mexican heather as it grows. The container needs to have drain holes and be at least 12 inches deep and wide, which will restrict root growth and keep the Mexican heather more compact. Using a container about 18 inches wide will allow the shrub’s root to expand and produce a wider and taller plant; however, the larger container will mean more weight from the soil and growing plant, necessitating chains capable of carrying the load. Mix one part potting soil and one part perlite to two parts peat moss. Using perlite will help to retain moisture. Remove the Mexican heather plant from its container and place it in the basket container. Place soil in the bottom of the basket container so the soil level of the plant is slightly lower (about 1 inch) than the edge of the basket container. Fill the remainder of the basket container with soil. Choose a part-sun to full-sun location to hang the basket container. Mexican heather tolerates dry soil but grows better if the soil is constantly moist; a part-sun location will reduce the amount of direct sunlight on the basket that could dry out the soil and heat the roots. If planted in full sun, plan to water the basket container once or twice daily. Water Mexican heather after planting. 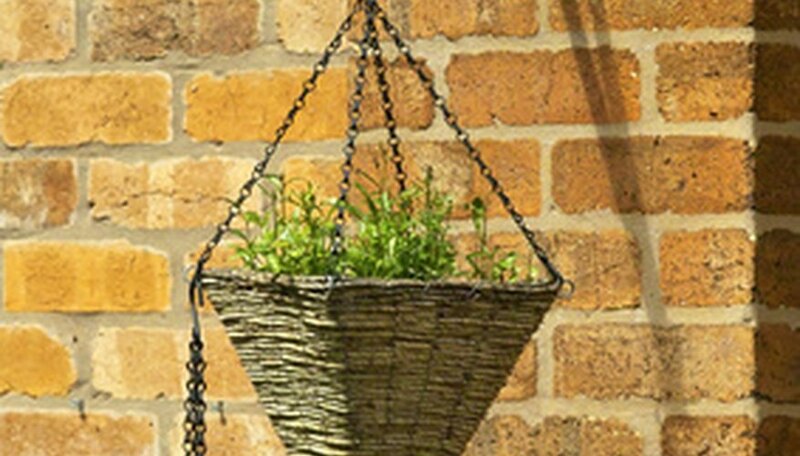 Hanging basket plant containers need watering more frequently than ground plants. Check the plant daily. In extremely hot, dry conditions, the container may need watering twice daily. Clip broken or rogue stems projecting out from the mound as the Mexican heather grows. The shape will remain compact and needs no additional pruning. Fertilize in late winter with a slow-release fertilizer. Fertilizer can be applied again in the summer. To help retain moisture, 1 inch of mulch, like compost or wood chips, can be added around the shrub. Keep the mulch 2 inches from the main stem.